The complexities and nuances of the law are made accessible in this engaging, illustrated guide. 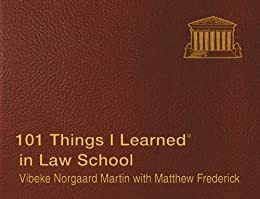 From the structure of the court system to the mysteries of human motivation, 101 THINGS I LEARNED® IN LAW SCHOOL reveals the intricacies of the legal world through questions big and small: What is a legal precedent? What is foreseeability? How can a hostile witness help one's case? How is legal argument different from other forms of argument? What is the difference between honesty and truthfulness? Written by an experienced attorney and law instructor, and disarmingly presented in the unique format of the 101 THINGS I LEARNED® series, 101 THINGS I LEARNED® IN LAW SCHOOL is an invaluable resource for law students, graduates, lawyers, and general readers. Some of the things in here are so profound they had me rethinking my whole approach to law and life. Must read once at least. 5.0 颗星，最多 5 颗星Cute book! I saw this at a gift shopping for twice the price. So glad I looked it up bc amazon saved me money. cute gift for a lawyer. Recipient loved it. 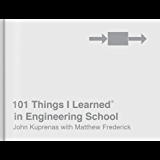 The Author has managed to select 101 unique statements, which highlight items you ought to know, whether you are an experienced lawyer or simply a layman. Some "obvious" truth suddenly gets new meaning and importance, when you see the statement reduced to powerful 3 -4 liners. The addditon of simple but powerful drawings, sketches, which beautifully illustrate the points made in the book, makes for a most fascinating read. You continously tell yourself - "I must remember this statement", so useful for future debates, even dinner table conversations. Read it and keep it handy to review and continously update your memory of these subtle true statements. I am really happy I made this purchase! This book gives a great understanding of what to expect to learn and understand in law school and the legal world for non law school students. Highly recommend as a gift or for educational exploration.